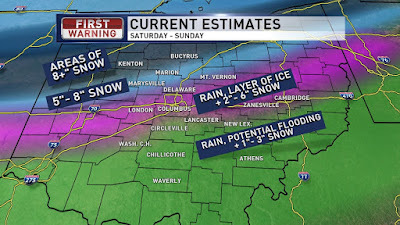 WINTER STORM WARNING for the Columbus metro area and Central Ohio through Sunday. WINTER WEATHER ADVISORY & FLOOD WATCH for far Southern and Southeastern Ohio through Sunday. SATURDAY: Snow/ice/rain likely, all snow & windy late. High 34. TONIGHT: Snow showers likely, very windy. Low 16. SUNDAY: Snow showers, very windy, cold. High 19. MONDAY: Partly cloudy, frigid. High 15. TUESDAY: Mostly cloudy, PM rain to mix late. High 37. WEDNESDAY: Rain/snow mix. High 35. The day is here and we are not cooling off this morning, so we are adjusting the forecast accordingly. 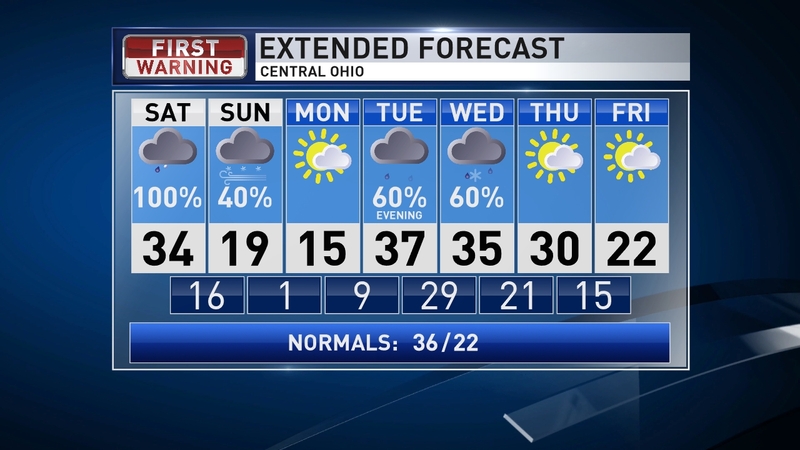 We have snow moving in for Northern Ohio, rain and ice along the I-70 corridor, and rain showers for Southern Ohio for the daylight hours today. As temps cool tonight the ice band will shift to the south and we all transition to snow showers this evening and overnight. With the ice line lifting a little more north it is going to take down the snow totals for Columbus and push more of the snow into Northern parts of the viewing area. Areas that stay all snow will see 5-8" of snow and pockets of 8+" possible, if not likely. Areas that see any freezing rain or sleet will see significantly less final snow totals. 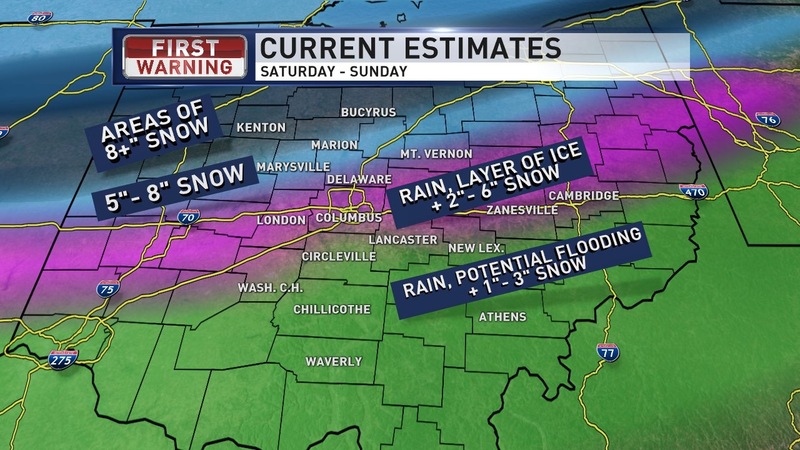 Once we do transition to snow then Central Ohio could see 2"-6" of snow later tonight, but areas that stay mostly rain will not have much time with the snow, so limiting that snowfall total to 1"-3" for Southern and Southeastern Ohio. Temps fall very quickly tonight with wind chills near or below zero most of Sunday into Monday morning. Some of the wind chills could be as cold as -10 to -20 late Sunday. Blowing and drifting snow will be an issue for rural areas on Sunday with a high of 19. Clouds parting some Sunday night will allow temps to fall near 0 and then we will struggle to reach the mid teens on Monday with a mix of sun & clouds. Another winter system, weaker, returns late Tuesday into Wednesday. 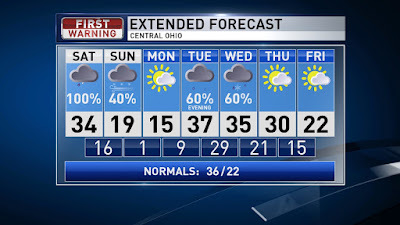 Highs will be in the mid-upper 30s for the start of the week. With the warmer air, it looks to start as rain late Tuesday then transition to a rain/snow mix next Wednesday. Then more cold air returns later next week. Have a good one!